If we know it or not many of us are shooting ourselves in the foot. Let me say before I got into HR, unbeknownst to me, I was doing things that did not help my own career. Then before becoming a resume writer, I had a functional style resume – which if you didn’t know is the worst style. Pow! shooting myself in the foot. I coach lots of people on career dos and don’ts – sometimes I’m right and sometimes I’m wrong because no one on the planet can predict human behavior with 100% accuracy. However, by using my HR knowledge and experience, along with my network of trusted sources, I can provide some pretty solid advice. 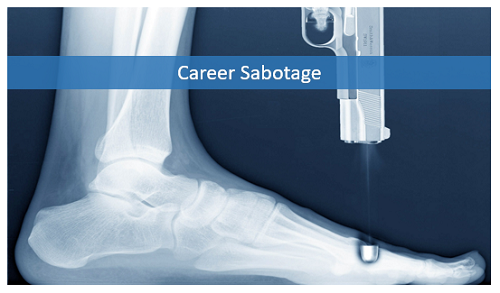 So what does that have to do with career sabotage? Well, a lot. Most of my clients and many of you have probably not had to look for a job in a long time and re-entering the job market after many years of employment is very similar to someone who has been unemployed for a while. You have to know what to say – what makes sense. You also need to be realistic and open to change. We all get stuck in our ways from time to time and become a bit too comfortable or complacent. When that happens we fail to grow. You can’t go forward if you are stuck in the same place. I advise my clients to expect anything and be prepared for everything. I also try to get them try a few things to be memorable and different – sometimes those things are uncomfortable and so they are reluctant. 1. Don’t be afraid to tell your career story and express your true needs. For instance, on a job interview, let it be known that you are in the job market because you want bigger challenges, a nicer organization, better resources, more responsibility or more pay. Be transparent. 2. Don’t be afraid to let a potential employer know you want the job and why. Yes, just tell ‘em. Why? It’s one of those things that help you be memorable. How? Well that’s a secret. 3. Don’t forget to thank them with handwritten thank you cards. Why? Come on, you should know. 4. Don’t be afraid to negotiate or not negotiate. One question that I have been getting lately is, what should I do if the company offers me a great deal upfront? Should I negotiate or haggle anyway or just take it. I say if you get what you want, then take it and move on, but If you want to negotiate further, I can help with that too. 5. Don’t be indecisive. I can’t stress this enough, when you don’t know what you want to do you will have the worst time in the job market! Know what you want to do and pursue it through all available resources. Alright, that’s all for now. Listen to my latest podcast with Chris Russell and Hannah Morgan here as we discuss all things job search.